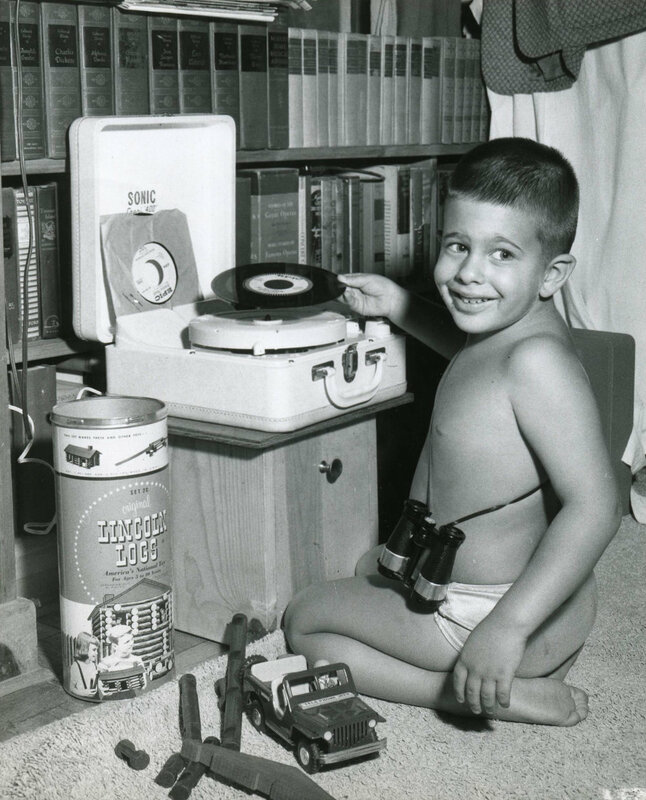 Budding audiophile Geoffrey poses with his fifth-birthday present (circa June 4, 1957; actual size approx. 7.7 x 9.5 in. (19.4 x 24.2 cm.)). It turns out that Geoffrey was even more nutty about my dad's audio system than I was (if you can believe that). My dad assuaged Geoffrey's audiophiliac lust by presenting him with a Sonic Capri 400 portable record player for his fifth birthday. This thing was no kiddie toy, but rather, a serious machine that could even play 12-inch LPs. You can bet that Geoffrey and I gave it an equally serious workout in the ensuing months. In addition to the array of brightly-colored children's records that were so popular back in the day, we spun some LPs too, some of which were knowing hand-me-downs from our father. Among the more memorable items in the latter category were Tchaikovsky's Nutcracker Suite, Rich vs. Roach, Alvin and the Chipmunks, and a really cool Capitol Records sampler that featured "Song from Moulin Rouge" ("Where is Your Heart"), "Quiet Village" by lounge-lizard idol Martin Denny, "Buckaroo Holiday" from Aaron Copland's ballet Rodeo, the closing moments of another ballet, The Seasons by Alexander Glazunov, and a really cooking big-band number performed by Stan Kenton and his orchestra! Rich vs. Roach must have influenced Geoffrey deeply, because he invested in his own drum set when he became a teenager. As for Alvin and the Chipmunks, I could not resist inferring that the voices of Alvin and the other chipmunks were really that of their creator and human foil, Ross Bagdasarian, Sr. I theorized that he recorded their voices at 16-2/3 rpm (actually, 7-1/2 ips tape speed), then sped up the playback at 33-1/3 rpm (15-ips tape speed). I practically begged my father to test my theory on his Garrard turntable, which had 16-2/3 rpm playback capability. He agreed (somewhat reluctantly), and I discovered that my theory was correct. The chipmunks sounded just like Bagdasarian, except that he was enunciating very slowly. My childhood innocence was forever shattered, which may explain my father's reluctance to conduct the experiment in the first place!